For the definition, typology and more, see our entry on Cooperatives. At the P2P Foundation, we do not believe that the development of cooperatives, competing within the dominant economic system today, is a sufficient alternative, see the article: Cooperatives Are Not a Viable Strategy Against Capitalism, by Sam Gindin. See our report, Value in the Commons Economy, which explains how commons-oriented cooperativism can instantiate different regimes of value, not just compete within the current system. "Peer production is about mutualizing knowledge and allowing anyone to freely aggregate his immaterial efforts to common pools of knowledge, code and design; stigmergy is the vehicle for mutual coordination of local and global collective efforts through transparency of the cooperation. Cooperativism and other such forms are about mutualizing property and physical infrastructures, such as to allow anyone to freely aggregate their efforts to common efforts at provisioning material good and securing a livelyhood; stigmergic coordination of physical production is obtained through open book accounting and open supply chains; and a proposed peer production license can create the solidarity around the commons pools of technical knowledge need for cooperative production. While immaterial cooperation, because of its anti-rival nature, requires a commons-based relational logic and the creation of universally accessible common pools of knowledge; material cooperation, requires mechanisms based on reciprocity and fair trade." Voluntary and Open Membership, Democratic Member Control, member Economic Participation, Autonomy and Independence, Education, Training and Information, Cooperation Among Cooperatives, and Concern for Community. Shareable commisioned these articles to help educate the general public about the value of cooperatives in creating democratic societies. "more than 800 million people around the world belong to one of these economic networks. Coops flourish in all sectors of modern society proving that sharing is a practical economic model. They represent a commons-based alternative to both the private market and state controlled enterprises. Four in ten Canadians are coop members (70 percent in the province of Quebec). In the U.S. 25 percent of the population belongs to at least one coop ranging from credit unions to food coops to major firms like REI and Land O’ Lakes dairy, according to the International Co-Operative Alliance In Belgium, coops account for 20 percent of pharmacies: in Brazil, 37 percent of all agricultural production is from coops; in Singapore, coops account for 55 percent of supermarket purchases; in Bolivia, one credit union handles 25 percent of all savings; in Korea and Japan, 90 percent of farmers belong to coops; in Kenya, coops account for 45 percent of the GDP; in Finland, 34 percent of forestry products, 74 percent of meat and 96 percent of dairy products come from coops. "The scale and impact of the UK’s mutual sector is revealed in the recently published Mutuals Yearbook, launched by campaigning group Mutuo at its annual conference in London. "We acknowledge the cooperative movement as one of the transforming forces of the present society based upon class antagonism. Its great merit is to practically show that the present pauperising, and despotic system of the subordination of labour to capital can be superseded by the republican and beneficent system of the association of free and equal producers." "We recommend to the working men to embark in co-operative production rather than in co-operative stores. The latter touch but the surface of the present economical system, the former attacks its groundwork." Bruno Jossa: Marx, Marxism and the Cooperative Movement. Cooperative Transitions to a Steady-State Economy. by Michael Lewis & Pat Conaty ; The Resilience Imperative is a key book integrating a vision of cooperatives in a broad social economy consisting of commons, solidarity economics, the principle of resilience, etc ..
Johnston Birchall, The Co-op: the People's Business: "For a full picture of the twists and turns of the history of the Co-op movement in the UK from the 1770s and right up to the mid-1990s with some earlier links to Ireland (before independence)"
John Curl, For All the People - Uncovering the Hidden History of Cooperation, Cooperative movements and Communalism in America. For the US history of Co-ops and the twists and turns. Gar Alperovitz's latest book (2013) What Then Must We Do? Bruno Roelants with Claudia Sanchez Bajo. Capital and the Debt Trap: Learning from Co-operatives in the Global Crisis. MacMillan, 2013. JW Smith (2009) Economic Democracy - a Grand Strategy for World Peace and Prosperity. Co-operation in the Age of Google. By Robin Murray. The New Wave of Mutuality. By ROBIN MURRAY. Policy Network, 2012. 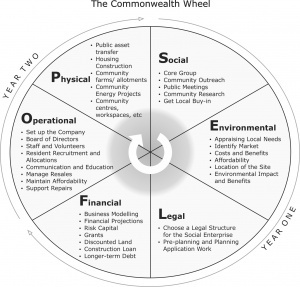 The Commonwealth Wheel by Pat_Conaty. This page was last modified on 22 November 2017, at 16:53.